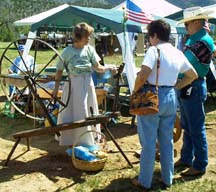 Some of the more fun things in my life are getting demonstrations of my crafts set up at fairs, faires, and festivals. Most of the time things go very well and we have no trouble at all. But then again, once in a while Disaster strikes!! We have been setting an information booth up at the New Mexico Ag Expo for about 11 of the 13 years this event has been happening. One year I had to cancel due to a death in the family. Most years the weather in February is atrocious! But this is what is needed to bring active farmers to the festivities! It is too cold to work in the barns and too nasty to plow, so they and their wives come to the Ag Expo. This year started out promising!! The wind was blowing at around 50 miles per hour across the plains and creating the look of the Dust Bowl Era. But things went downhill from there very rapidly. The wind settled, the temperatures hit the 70s, but that wasn't the Disaster!! As I was getting the spinning wheels and woven and crocheted things out of the truck, my husband was going to pull my tables out of the trailer. I still have no clue what happened back there. When I came back out of the building he was laying on the gravel drive area, half under the trailer on his back. He had a sort of glazed look to his eyes! He answered all the questions as if he were with us!! How many fingers am I holding up? Can you raise your arm? Can you smile at me? What happened? We let him stand up and then sit in a chair I pulled out of the trailer. He flatly refused medical help and refused to let me take him to the hospital ER as well! I finished setting up my display and came back to the truck. I moved the truck and trailer to the back of the building to unhook the trailer. His right eye became increasingly bloodshot and was turning black around it. But he fell backward out of the trailer? Maybe he hit something I can't see. I should have ignored him and taken him to the ER then!! But no, I let him have his way. Our granddaughter came later in the evening to take us to dinner. He didn't want to go, said his head hurt too much to think of eating, but did drink one of those Fuze drinks. It promptly made him sick to his stomach. Still, I didn't insist that he go to the hospital. I left him in the motel the next day, worrying about him all the time I was away. Granddaughter went back over and checked on him several times. That night he still wasn't in the mood to eat but did conceed that he might have a concussion. The next day he went with me to the Expo and mostly sat in the corner of the display booth quietly. I took everything apart that night and loaded it and we came home. The next morning he decided he definately needed to see the doctor. So I took him to the ER. The CT scan showed that he did have bleeding on the brain, and the ER doc gave him a very bad time for not appearing in an ER sooner. Hey, girls!! Don't let your hardheaded guy get away with this!! They suffer much too loudly!! They won't suffer any more or less by being taken to the ER immediately, but you can worry less.